Of the 3600 responses to Suffolk County Council’s home-to-school transport consultation, 85% “strongly oppose” and a further 5% “oppose” Option 1; 70% “strongly oppose” and a further 12% “oppose” Option 2. In contrast 73% of respondents strongly support, and another 10 ‘support’ retaining the status quo: Option 3. Option 3 is therefore very clearly the will of the people. 3.600 is the most responses received by any Consultation in recent years, and it is clear that parents, teachers and communities across Suffolk have very serious concerns. Despite this, cabinet has decided on, and will only be discussing Option 2. Back in March, the Conservative majority at Suffolk County Council voted unanimously against an opposition motion that would have allowed all councillors the chance to vote, unwhipped, on all the final school transport proposals, before the Cabinet makes a decision in June. This was unfortunate to put it mildly. These proposals have been causing considerable concern to the county at large. They may also have a significant impact on Woodbridge – because it is a town containing 8 schools. Woodbridge Town Councillors will recall I raised this as a significant concern in previous reports to you (2018: March, February, January and passim). In these, I urged Woodbridge Town Council to respond to the consultation, both individually and as a formal body. I was particularly concerned because I had heard from SCC that there had been a low response rate from the East of the County. I have had neither acknowledgement nor confirmation as to whether Woodbridge Town Council did this, which is disappointing. I also contacted Farlingaye High School to ask it to ensure parents were wholly aware of a need to respond, and gave up one Saturday morning just before the end of the consultation to hold an awareness-raising stall in Woodbridge Thoroughfare where local people could respond directly. We were responsible for about thirty responses from that morning alone. 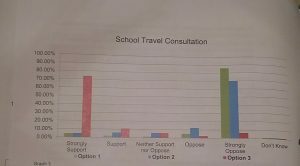 It was clear that the people of Woodbridge had very little understanding of the impact Options 1 and 2 had to the town – a town with 7-8 local schools. Reducing eligibility for buses means that there will be significantly more cars driving on our streets and parking near our schools during the school rush. Cabinet makes this decision on June 19th. I, along with my Group, have opposed the proposed changes since they were first announced in September and we will continue to raise our concerns at the Cabinet meeting. New Council Leaders: Following a leadership challenge in the Conservative Group at the Council, Cllr Matthew Hicks has been elected as the new Leader of Suffolk County Council, replacing Cllr Colin Noble. His Deputy will be Cllr Mary Evans, former Chair of Scrutiny. Cllr Hicks has promised a “new era” of politics at the Council, with a focus on mutual respect, collaboration and co-operation. We are hopeful that he might be more open to working with, and listening to, councillors from other parties (although the School transport paperwork is not encouraging). The first major change has been the removal of the unwieldy and untransparent Cabinet Committees, only established in September 2017. They will be replaced by Policy Development Panels (although we do not currently have the full details on how these will operate.) These worked very well in the past: I worked with Mary Evans on the former Transport PDP where we created the new speed panel frameworks were created. This may be a hopeful sign for the 20mph and associated calming in Woodbridge. In other news there has been a change in Leadership in my group. Last May my party joined with the Greens and Independents to create the Lib Dem Green and Independent Group on Suffolk County Council and I had the privilege to be appointed the first (and only) Group Spokesperson for Women in the county, in addition to Spokesperson for Transport and Adult Care. The group has had a number of successes in this last year: opposing the School Transport changes, calling successfully for the abolition of single use plastics in Suffolk, exposing the council’s gender pay-gap and supporting an urgent review of the transition arrangements for WASPI women. At the recent LDGI group AGM, the Leadership moved to Green Cllr Andrew Stringer, and I was elected Deputy Leader. Woodbridge 20mph zone and Thoroughfare scheme are both now finally showing signs of progression. I have had an outline design for the 20mph and associated calming scheme created and costed; the Town Clerk has applied for £100,000 CIL money to help fund this. Cllr Patricia O’Brien wants to be involved at the Martlesham end. I have asked her to inquire of our colleague Cllr Nicoll if he has any interest in forwarding the part of the scheme that is on the Melton Woodbridge division border. We are meeting with officers in a couple of weeks. Astonishingly, the National Audit Office has revealed that over 1600 schools in the UK have not been inspected by Ofsted for 6+ years. In Suffolk, 23 outstanding schools – almost half of those rated ‘outstanding’ – have not been inspected for at least 6 years. For 6 of these schools, their last inspection was over a decade ago. This means that whole cohorts of students have gone through school without a single Ofsted inspection. My Group’s Spokesperson for Education, Cllr Penny Otton, raised the issue and her concerns at May’s Council meeting. The Cabinet Member for Children’s Services and Education, Gordon Jones, assured her that he shared her concerns and would raise it with the head of Ofsted. Unitary discussions on hold In March, it was announced that then-leader Colin Noble had unilaterally commissioned the think-tank Respublica to produce a report outlining the options for a unitary council in Suffolk. This news was not well-received by the District and Borough Councils, who had not been consulted by Cllr Noble. However, in the lead-up to the Conservative Group leadership election in May, Cllr Noble announced that work producing the report had been suspended. It is not yet clear whether this work will resume under the new leader, Cllr Hicks. Millicent Fawcett Statue and women in government: As Suffolk LDGI Group Spokesperson for Women, I made it my business to attend the unveiling of Millicent Fawcett’s statue in Parliament Square, carrying a banner to remind onlookers: “Suffolk Women Lead the Way.”https://twitter.com/CroPage/status/988686126239174656 It was a point needing making! Modern Suffolk has a high gender pay gap, high levels of violence against women, specifically poor outcomes for girls (particularly in rural areas). Suffolk is yet fully to engage in recognising the importance of its own women and what they have to offer. I was recently invited to appear on BBC’s Sunday Politics to stand in for Norman Lamb – specifically to talk about women in politics and the local elections. Library Reading Scheme presentations On 17 September I presented awards to all those children who successfully completed the Woodbridge Library Reading Challenge 2017. This year 212 children completed, to gain certificates and medals. I also funded a poster competition and a magic show from my locality budget. Suffolk’s Cabinet decision on controversial school transport policy changes called-in by LDGI Group A decision made by Cabinet on 12 September, to go to public consultation on proposed changes to SCC’s school transport policy, was ‘called-in’ to scrutiny by opposition councillors from the Liberal Democrat, Green and Independent Group (of whom I was one). The call-in cited several problems with the report that informed Cabinet’s decision, and argued that to go to public consultation without a comprehensive impact assessment would be premature. The councillors questioned the expected savings and stressed the need to fully research how changes might impact on educational attainment, increased car use, and school viability. The call-in was examined by the Scrutiny Committee on 28 September, who determined determined that the subject should be referred back to Cabinet again. Watch this space! Consultation on Woodbridge Thoroughfare September 25- 1October saw the Thoroughfare Working Group’s public consultation in Woodbridge Library on changing the Traffic Regulation Order (TRO) in the Thoroughfare. A stall was staffed in Woodbridge Library for a full 7 days (I personally worked 44 hours staffing it). The consultation is to ensure it more accurately reflects current usage and to make the provisions more enforceable. Three options were provided. Approximately 600 questionnaires have been received, and the information will now analysed and used to establish the basis of a new TRO. Impact of Woods Lane development on A1438 The astonishing and unacceptable closure of Woods Lane for a prolonged period ( 3 weeks shortly and then three months in early 2017) to install utilities for the 180 house Bloor Homes development will divert heavy traffic between the A12 and Wilford to the B1438 (Ipswich Road) in the south and the Old Yarmouth Road through Melton to the north. I am one of many lobbying to ameliorate this situation, not least because of the number of schools and sheltered housing along the route. When I recently was able to secure permission for 20mph zoning in Woodbridge, a significant rationale was the impact of heavy traffic on our medieval town , the number of pedestrians and cyclists inconvenienced or endangered, ­­­­and to discourage rat-running on the B1438 instead of A12/Woods Lane usage. Although the field of candidates was strong it was decided that there was no clear candidate that met the expectations for the role. Therefore no appointment was made, and the recruitment process will begin again in the coming months. In the mean time Sue Cook will contine as interim Chief Executive, supported by other members of the corporate management team. PCC ‘not pursuing’ plans to take control of Suffolk Fire and Rescue Service Suffolk’s Police and Crime Commissioner, Tim Passmore, has announced that he will not be pursuing plans to take control of Suffolk Fire and Rescue Services. Earlier this year the PCC commissioned PA Consulting to undertake an options appraisal to consider the future governance of the Fire and Rescue Service and a potential shift of governance from the County Council to the PCC. This review concluded that there is insufficient evidence to suggest that a governance change would be clearly in the interests of economy, efficiency, and effectiveness; or public safety. The ‘escape plan’ fire campaign will run until 31 October 2017. More information can be found at fire.suffolk.gov.uk.